Meezan Internet Banking is the complete way to bank whenever and wherever you may be. 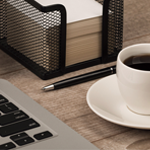 Simply enjoy the finest banking experience from the comfort of your own home or office. View up to date balances of all your accounts. You can transfer funds between the same title of accounts upto Rs. 5 million per day. You can transfer funds up to Rs. 2 million per day to your registered third party benefitiary accounts within Meezan Bank. You can transfer funds upto Rs. 1 million per day to your registered beneficiaries accounts of other bank(s). Now, you can register unlimited beneficiaries for MBL & Other Bank (IBFT) transfer. You can change your card's status (Active / Inactive) from this menu. You can view your past activities through this option. You can change your username, Password from this option. Lodge your complaints and submit your feedback for the improvement of services. You can request the bank for making Payoder online. 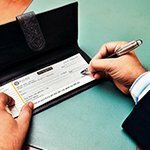 You can request bank for Cheque Book online. You can request bank to update your particulars like email address, Mobile Phone, Address etc. 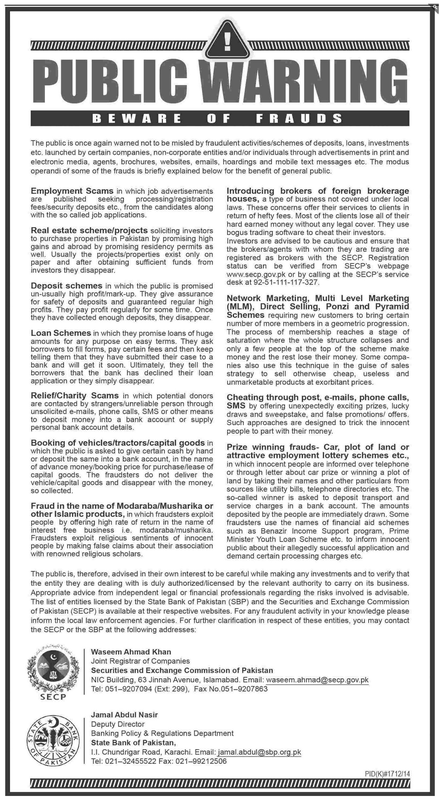 All Meezan Bank and Al-Meezan Investments common customers can use this service. Registration, Conversion, Investment, and Redemptions of Al Meezan Investments Mutual Funds can be done online. 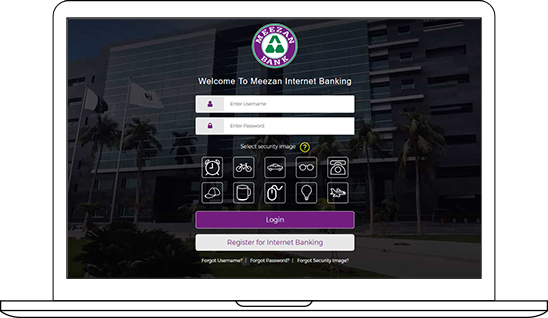 Meezan Mobile Banking App relies on high-security mechanisms to protect customer’s privacy and financial information from login to logout. 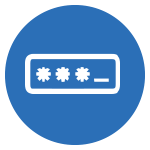 Transactions are processed behind our firewalls, 128-bit encryption is used throughout and user identity is verified through multiple factors. Simply call our Call Center at 111-331-331 or 111-331-332 to reset your username and password. Who is eligible to use Meezan Mobile Banking App? Any active Meezan Bank Account holder* can use Meezan Mobile Banking App. For details on which Account types are eligible to use the App, please call our Call Center at 111-331-331 or 111-331-332. No. This service will work with any type of internet connection. It could be through a Wi-Fi connection or your pre-paid or post-paid mobile network connection. No information is stored on your mobile phone which means that your Username and Password are never exposed even if your mobile phone is lost or stolen. What do I require to use Meezan Mobile Banking App? Are there any charges for using Meezan Mobile Banking App? The App is free to use! How do I register Funds Transfer beneficiaries? 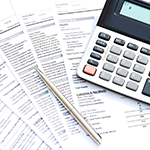 How do I manage Funds Transfer beneficiaries? What is the funds transfer limit on Meezan Mobile Banking App? 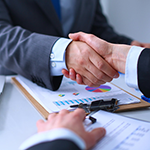 - You can transfer funds between the same title of accounts upto Rs. 5 million per day. - You can transfer funds up to Rs. 2 million per day to your registered third party benefitiary accounts within Meezan Bank. - You can transfer funds upto Rs. 1 million per day to your registered beneficiaries accounts of other bank(s). Can I use Meezan Mobile Banking App if I am travelling outside Pakistan? Yes you may use the App globally. All you need is a stable internet connection. QR Payments via FonePay App! Go cashless with Meezan Bank’s QR Payments facility. Simply scan the QR code at any FonePay Merchant and pay directly from your Meezan Bank Account. 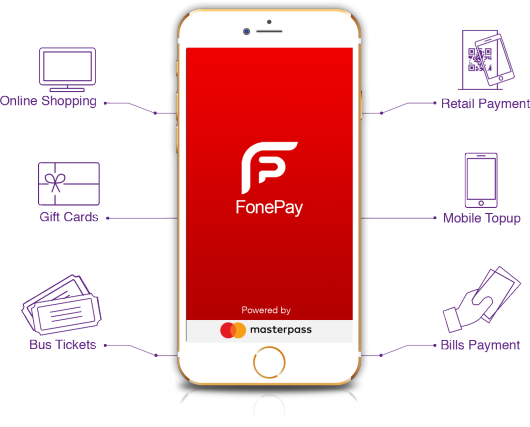 Download the FonePay App today and experience the latest innovation in payments powered by Masterpass! A QR code (Quick Response Code) is the trademark for a type of matrix barcode, which can be scanned by Smartphone camera. The product is offered to all Meezan Bank Account holders via ‘Scan & Pay’ feature which results in saving time and effort while shopping at a merchant outlet. How to sign up for FonePay App? You can easily download the App from Google Play or Apple Store. Once installed, please enter the required information such as Name, Mobile Number and select 4 digits Passcode to login. How to link my Meezan Bank Account to the FonePay App? All Meezan Bank customers can link their Bank Accounts with the FonePay App by calling Meezan Bank’s 24/7 Call Center from your registered contact number. How to perform transaction via FonePay App at a retail store? Customers can perform transactions at any merchant where FonePay QR payment is accepted. You have to scan the QR placed at payment counter, enter amount and MPIN to execute the transaction. A customer can spend upto Rs. 10,000 per day from the FonePay App. How to delink / re-link my Meezan Bank Account with the FonePay App? Simply call at our 24/7 Call Center at +92 21 111 331 331 or +92 21 111 331 332from your registered contact number to proceed with de-liking/re-linking. How to set up an MPIN? Once your Meezan Bank Account is linked successfully, an OTP (One Time Passcode) will be sent to your registered mobile number. The FonePay App will ask to change the MPIN on first transaction. Set your desired MPIN and keep it safe for future transactions. Log in the FonePay App and select the ‘Change MPIN’ option from the main menu. You will be required to enter the old MPIN before changing to a new one. Please call at our 24/7 Call Center at +92 21 111 331 331 or +92 21 111 331 332 from your registered contact number to reset your MPIN. What if I forget my Login Passcode? You may reset your Login Passcode from the FonePay App login screen. How do I change my Login Passcode? Log in the FonePay App and select the ‘Change Passcode’ option from the - main menu. You will be required to enter the old Passcode before changing to a new one. What is meant by One Time Passcode (OTP)? One Time Passcode (OTP) is a 4 digit online verification code. One Time Passcode is sent to your mobile number registered with Meezan Bank whenever you link or delink your Meezan Bank Account with FonePay App. What are the other types of transactions offered in FonePay App? There are multiple types of transactions you can perform which are updated time to time in FonePay App such as Bill Payments, Mobile Top-up, Bus or Event Tickets, Online Purchases etc. Instant Balance Inquiry : You can see your latest account balance. Past Transaction Inquiry (last 3 transactions exceeding Rs. 50) : You can see the details of your last 3 transactions. Your cellphone number must be updated with us. Note : To avail this service your number must be registered with Meezan Bank. If it is not please contact your branch. To block the service type MBLBLKPULLBRANCH CODELAST FOUR DIGITS OF YOUR ACCOUNT NUMBER. Telecom company rates apply. Debit Alert: An instant SMS alert to inform you when any amount is deducted from your Current or Savings account(s). Credit Alert: An instant SMS alert to inform you when any amount is added into your Current or Savings account(s). Cheque Bounce: An instant SMS alert to inform you that your cheque has been dishonored. 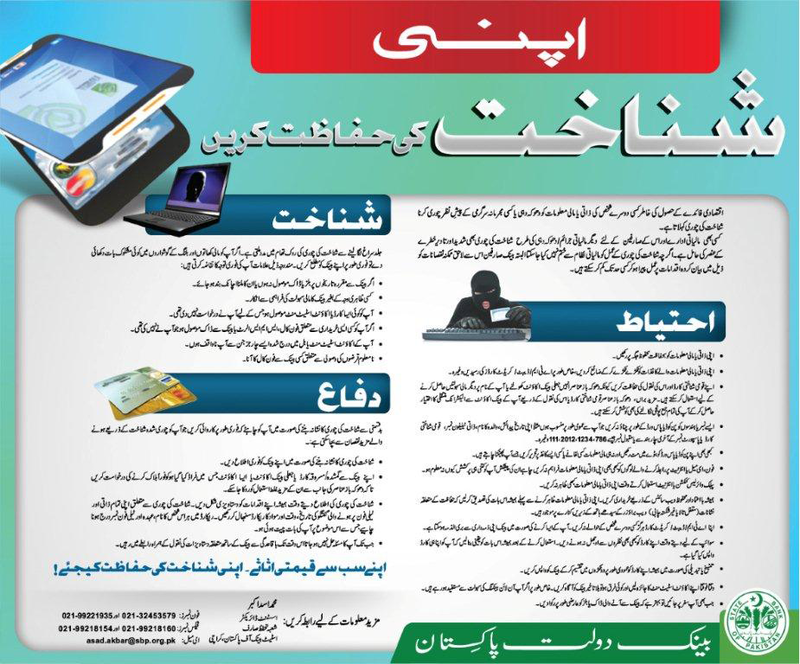 Please visit any Meezan Bank Branch or contact Call Center for SMS Alert subscription. It takes around three working days. Charges are applicable as per the Schedule of Charges. 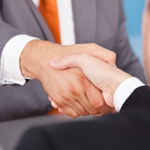 Individuals, Sole proprietor, Partnership & Company Accounts are eligible for this service. Meezan Bank Debit Card customers can now simply ' Tap and Pay ' at payment counters of all NFC enabled merchants across the globe along with additional security of EMV or chip card technology. Access your money from any location at any time with our range of EMV & NFC enabled Debit Card suited to every type of customer. NFC or Near Field Communication capability allows contactless payments on a secured payment terminal instead of inserting or swiping your card. The feature is offered on all Meezan Bank Debit Cards powered by Visa PayWave or Mastercard contactless Tap and Go. The solution replaces cash with ‘Tap and Pay’ which results in saving time and effort. What is EMV or chip card technology? EMV is an acronym that stands for Europay, Mastercard and Visa. They are the founding companies for chip card technology. EMV is a payment application that resides in a computer chip embedded in a debit card. 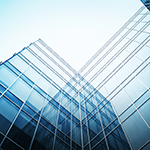 The application specifications were developed to help fight fraud. The term ‘EMV’ and ‘chip card’ are interchangeable. How do I get an EMV and NFC enabled Debit Card? 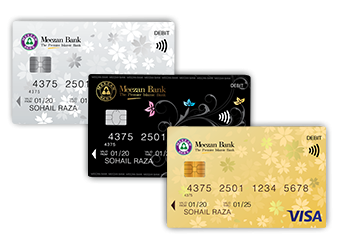 All new Meezan Bank Debit Cards are EMV and NFC enabled. To get your new EMV NFC card, simply contact our Call Center at (+9221) 111-331-331 or 111-331-332 or visit your branch to get your new card. Replacement charges will be applicable. How is NFC card different from regular debit card? 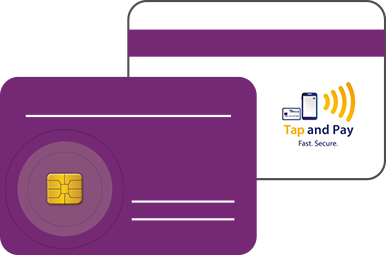 NFC cards use an embedded radio frequency antenna and microchip that allows a transaction to be processed by simply tapping the card on a merchant’s payment terminal instead of swipe and signature on receipt. NFC card transactions are processed through the same secured networks used for Visa and Mastercard transactions. You never lose sight of your card while each transaction has a unique, encrypted code that changes every time the card is used. What are the security features of NFC card? Short Range:	The card only works within short range of a merchant terminal, which makes it difficult for fraudsters to gain access to card information from a distance. Encryption: NFC cards use much more secure international EMV chip standards and advanced cryptography. During a transaction, a unique encryption code is shared between the card and device which expires after every transaction. If someone were able to get close enough to steal data from your card, they would still be unable to use the encryption code as it would have been expired. 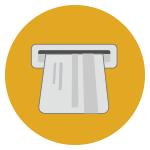 Limited Information:	Only limited information is used in a ‘Tap and Pay’ transaction like language preference, card number and other coding. 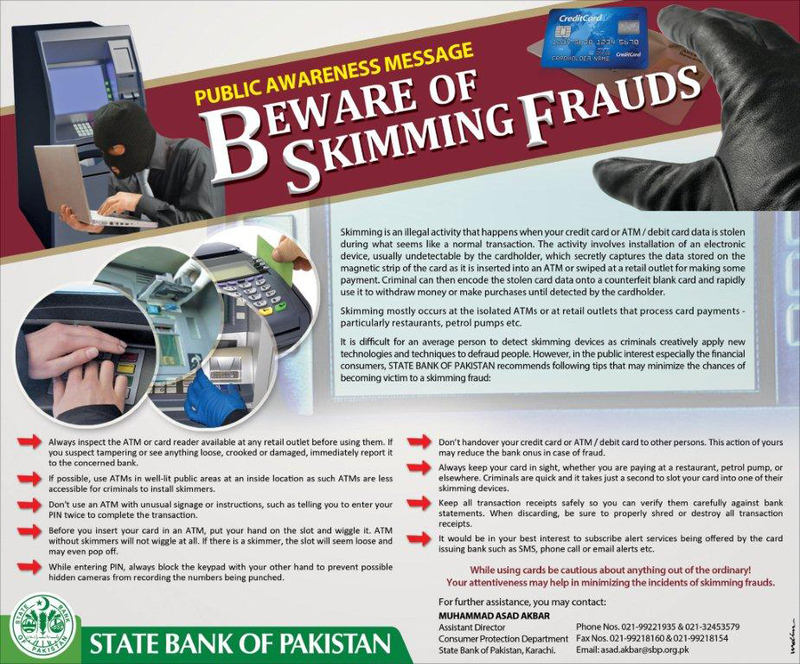 Customer’s name, bank account number or the three-digit security code is not transmitted during a transaction. Low Transaction Limit: Your card can only be used for a Rs. 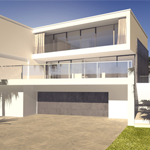 5,000 transaction offering greater security. Larger purchases will require card to be swiped by the merchant. During a payment transaction, the chip performs cryptographic processing by assigning a unique code to each transaction. This helps prevent the transaction data from being fraudulently reused. Chip processing takes place only when the card is used at a chip-activated terminal. 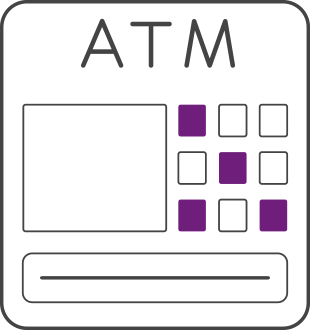 A chip terminal is a point-of-sale (POS) device or ATM that is able to process chip transactions. Instead of swiping your card, you insert it in a chip terminal and leave it in the terminal until the transaction is complete. If a merchant does not have a chip terminal or if their chip terminal is not yet activated, transactions will be processed by swiping the card’s magnetic stripe just as they are processed today. 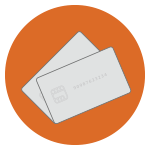 Both chip and magnetic stripe card transactions are processed very quickly. Leaving your card inserted, versus swiping the card, does add a few seconds on to the transaction in order to assign the unique code to your transaction. This is a step that does not exist with magnetic stripe only transactions; and, it is what adds the additional layer of security. Will I still be required to sign for my debit card purchase? 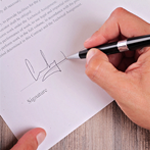 You will be required to sign for all your debit card purchases. However some merchants may require you to enter your PIN to complete a transaction if the merchant’s terminal supports PIN entry. Is my card considered ‘chip and signature’ or ‘chip and PIN’? 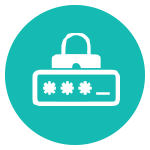 Both ‘chip and signature' and ‘chip and PIN’ refer to the way a card is authenticated at the terminal. Your card will be authenticated using chip and signature, which offers the same cryptographic security as chip and PIN. Can I still swipe my card if I don’t want to use the chip? Most merchant terminals will require the chip to be used if the terminal is enabled to accept chip transactions. The terminal should prompt you to use your chip when it is a requirement. Using the chip is a more secure transaction method than magnetic stripe-only at point-of-sale, so this is the preferred method where merchants have enabled chip transactions. 24/7 Fraud Monitoring – We always monitor your accounts for suspicious activity and attempt to contact you when we see something out of the ordinary. SMS Alert Service – You will receive alerts for your purchase transactions by default on your registered mobile number. 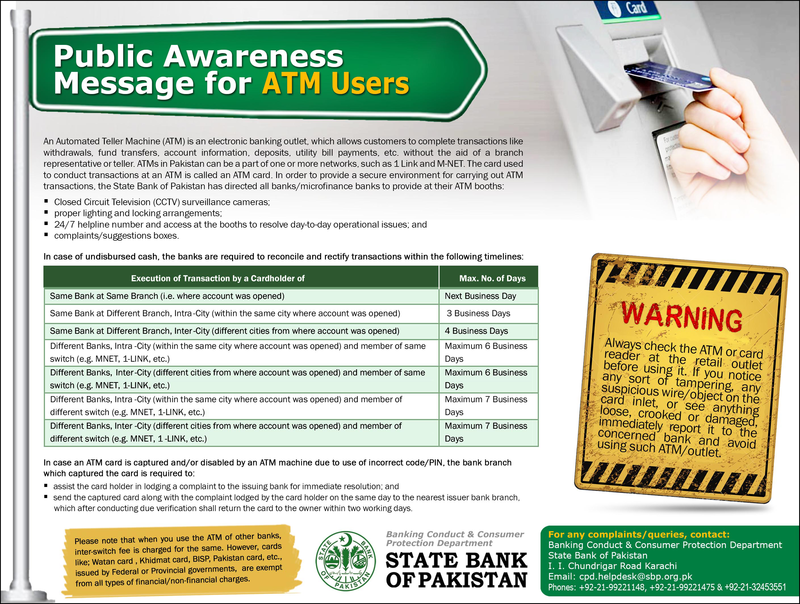 You may also opt for SMS alert service (additional fee applicable) to receive transaction alerts on all account activities. Want access to your money anytime, anywhere? With a Meezan Visa Debit Card, you have access to the money in your account wherever you are, whenever you want, wherever you see the Visa symbol. The money is deducted from your balance straight away — there is no interest to pay, no bills & no late fees! More than just an ATM card, you can use your Meezan Titanium MasterCard Debit Card wherever MasterCard is accepted. Whether you want to pay for fuel, shopping, dining or anything else, you can easily use your Meezan Titanium MasterCard Debit Card to access the funds in your account rather than carrying cash. The Platinum Mastercard Debit Card opens a world of convenience for customers by giving them access to 2.1 million Mastercard compatible ATMs and 32 million Merchants in Pakistan and around the world. Our customers can shop, dine, travel and refuel whenever they want, wherever they want. Platinum card holders also get free access to International CIP lounges as well as higher withdrawal and POS transaction limits. Share the Convenience and Joy! With supplementary cards, you can off-load the responsibility of providing cash to your loved ones for their day-to-day expenses. Not only this, you can also provide shopping independence and share the benefits of your Meezan Debit Card with your spouse, children, siblings, parents, friends and loved ones. 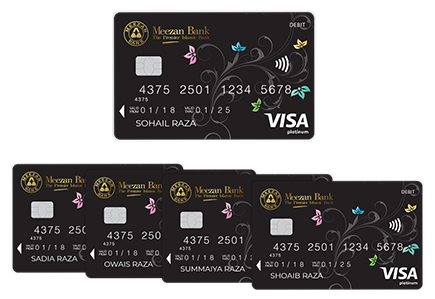 Meezan Bank Debit Cards are powered by Visa and Mastercard. The Card is acceptable at over, 14,000 ATMs and 50,000 POS (Point of Sale) locations nationwide along with over millions of POS locations and ATMs worldwide. Moreover, you can use this card to shop online at millions of ecommerce merchants around the world. 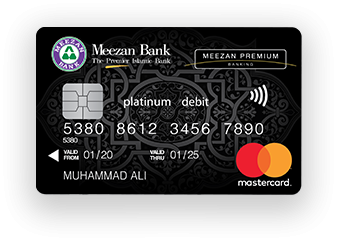 Meezan Debit Card provides layers of security for your Card, offering you a safe banking experience. 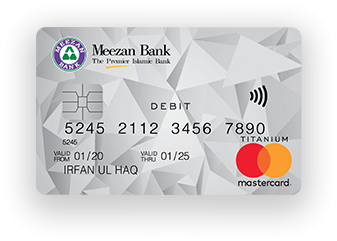 Meezan Debit Cards are Chip-based card that significantly increases data security for your transactions as well as Card information and limits card cloning and fraudulent activities. In addition, Meezan Visa Platinum Debit Card is powered by ‘Verified by Visa - a service that offers added online protection while shopping with a number of leading online merchants. Meezan Bank Debit Card is NFC enabled, providing you the convenience to make contactless payments at retail outlets. With a built-in NFC technology, you can now enjoy faster payments without the hassle of signing transaction slips at all retail outlets supporting the Visa/Master contactless symbol. With Meezan Bank Debit Card you can enjoy discounts of up to 25% on the partnered merchant locations. Moreover, Platinum and Titanium card holders can enjoy complementary access to CIP lounge at Karachi, Lahore, Islamabad Multan and Sialkot airports. What is a supplementary Debit Card? Supplementary Card is an Add-on Card which allows customers to share the convenience of making day to day payments with near and dear ones. The Card is issued upon primary customer’s request and linked to primary customer’s account. Supplementary Card holder is eligible to avail Card related benefits like ATM, POS & ecommerce usage, discounts etc. Who is a Primary Card holder? Meezan bank account holder having a Debit Card is a Primary Card holder. Who can request for a Supplementary Card? Only Primary Card holder can request for a Supplementary Card. Primary Card holder will have to visit his/her parent branch. Primary Card holder will be required to fill and sign the application form. Whom can I issue supplementary Card? 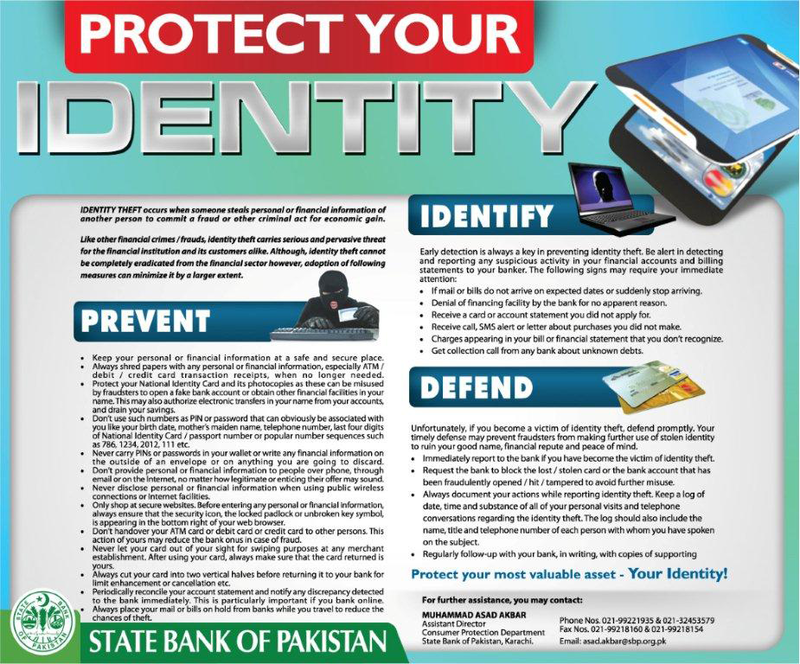 Supplementary Card can be issued to your spouse, children, parents, siblings, and friends. What are the spending limits of supplementary Cards? How many supplementary Cards can be issued by a Primary Cardholder? Maximum 5 supplementary Cards can be issued with a primary Card. Which Card types are eligible for supplementary Cards? What is annual fee of supplementary Card? The annual fee of supplementary Card is same as of primary Card. Also other transaction related charges also same. Please refer to schedule of charges for details. 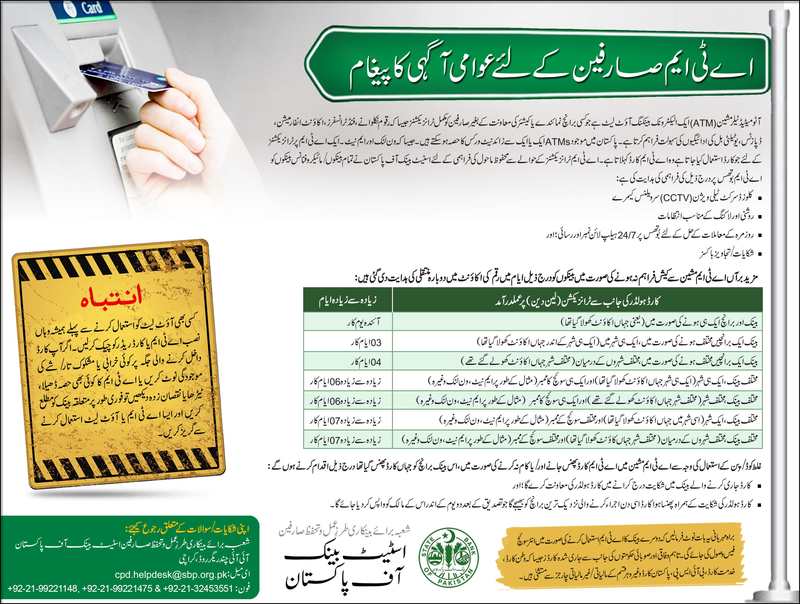 Who can collect Supplementary Card from Meezan Bank branch? Only Primary Card holder can collect Supplementary Card from his/her parent branch. Who can activate Supplementary Debit Card? Only Primary Cardholder can activate Supplementary Card. How do I activate supplementary Debit Card? What should I do if I have lost my supplementary Card? In case of Card is lost or stolen, either primary or supplementary Card holder can block the Card by calling our Call Center at +92 21 111331331-2. How do I request for a replacement of supplementary Card? Primary Card holder can request for a replacement of supplementary Card by calling our Call Center at +92 21 111331331-2. Can I view supplementary Cards transactions in my bank statement? Yes, you can view supplementary Card transactions in your bank statement. Will I get an SMS alert of supplementary Card transactions? Yes, Primary card holder will get SMS alerts if subscribed. 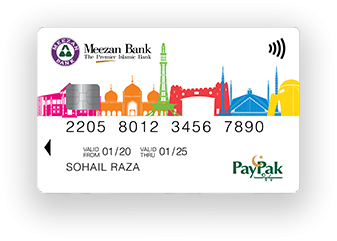 Meezan PayPak Debit Card is a PIN based card that ensures utmost security not only at ATM machine for cash withdrawal but also at POS terminal while shopping at all merchant outlets across Pakistan. Meezan Bank’s Debit Card can now be activated from your nearest Meezan Bank ATM. This quick and simple service has been introduced to allow greater convenience to our valued customers. Meezan Bank Debit Cards can now be used for online shopping securely using Verified by Visa or Mastercard Securecode. Your card is now protected by Verified by Visa (VBV) or MasterCard SecureCode platform for internet-based transactions. This is the latest technology supported by Visa & MasterCard, designed to ensure safe e-commerce transactions through authentication of each transaction by the cardholder so that you can use your card online with more confidence. With this service, when you use your Debit Card on websites that have incorporated the "Verified by Visa" or “Mastercard Securecode” sign, you will receive a One-Time Passcode (OTP) either by SMS or email to complete your transaction. To avail the benefits of this service, you must ensure that your mobile phone number and/or email address are updated with us. Get enhanced protection when shopping online on Verified by Visa or Mastercard Securecode enabled websites as each payment requires secondary verification via SMS and/or email. Make online purchases from many international websites that prefer Verified by Visa or Mastercard Securecode enabled cards. Enjoy hassle-free online shopping. With the introduction of this service, your Meezan Bank Debit Card is automatically enabled for internet-based transactions. Verified by Visa or Mastercard Securecode is a global authentication service offered by Meezan Bank to its cardholders. 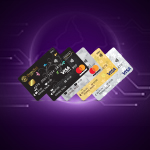 It provides the cardholder with a unique One Time Passcode (OTP) ensuring that only the real cardholder is able to complete an Internet-based transaction, improving online security. One Time Passcode (OTP) is a 6 digit online verification code that you receive each time you make an online purchase using your Meezan Bank Debit Card. One Time Passcode is sent to your mobile number and / or email address registered with Meezan Bank. 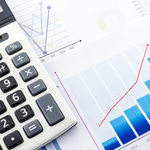 How much does Verified by Visa or Mastercard Securecode cost? It is free for all Meezan Bank cardholders. What browser do I need to use for Verified by Visa or Mastercard Securecode? All you need is an internet connection and an internet browser such as Internet Explorer, Google Chrome, Netscape, Mozilla Firefox, software version 6.0 or above. Can I use Verified by Visa or Mastercard Securecode on any computer? Yes. It can be used on any computer connected to the Web/Internet. All Meezan Bank Debit Card customers are registered for Verified by Visa or Mastercard Securecode service. How will I shop with Verified by Visa or Mastercard Securecode? On initiating any Internet-based ecommerce transaction using Meezan Bank Debit Card, Verified by Visa or Mastercard Securecode facility will be extended to you. How does Verfied by Visa or Mastercard Securecode work? Where will I be able to shop using Verified by Visa or Mastercard Securecode? 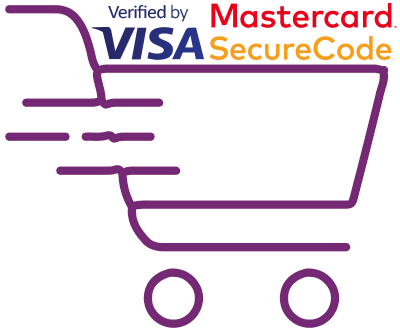 You can shop at any online store that has the Verified by Visa or Mastercard Securecode symbol. Once the transaction is processed, will I be notified of the same? Yes, once transaction is posted an SMS from MBL will be sent to the customer, stating that their transaction of xxxx amount has been processed. Will I receive One Time Passcode for all my online purchases? No, you will only receive One Time Passcode for online purchase(s) from any participating Verified by Visa or Mastercard Securecode merchants. If I lost my mobile phone, can I provide a temporary phone number while waiting for my new phone number? No, One Time Passcode (OTP) will only be sent to the mobile phone number registered with MBL Alternatively, you can opt to receive OTP on your email address registered with MBL. However, please ensure your mobile phone is with you when you make an online purchase and that your mobile phone number and email address registered with MBL is updated at all times. If my mobile phone is on roaming mode while I am abroad, will I receive One-Time Passcode for online transactions made then? Yes, customers will receive One Time Passcode via SMS. However, roaming charges (if any) will be borne by MBL customers. What should I do if I did not receive my One-Time Password? If you did not receive your One Time Passcode, you may click on the “Resend OTP” button on the authentication screen to request for another OTP. One Time Passcode will be sent to your mobile number/email address immediately. However, you can only request one OTP for each online transaction. What happens if I have entered invalid OTP up to 3 times? A web message will pop up informing you that your online purchase is blocked due to maximum invalid attempts of One Time Passcode. You can only try entering your OTP 3 times. If it is correct, it will be accepted, if attempted 3 times incorrectly, your online transaction will be rejected. 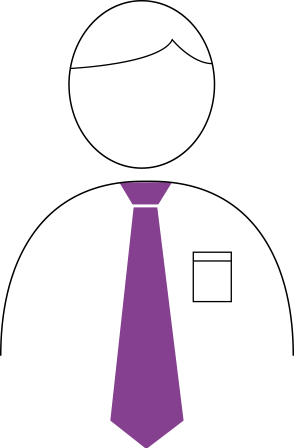 In a scenario where an online purchase is rejected, the transaction would then have to be re-initiated with a new OTP code. What should I do if I receive an SMS Alert for One Time Password not performed by me? 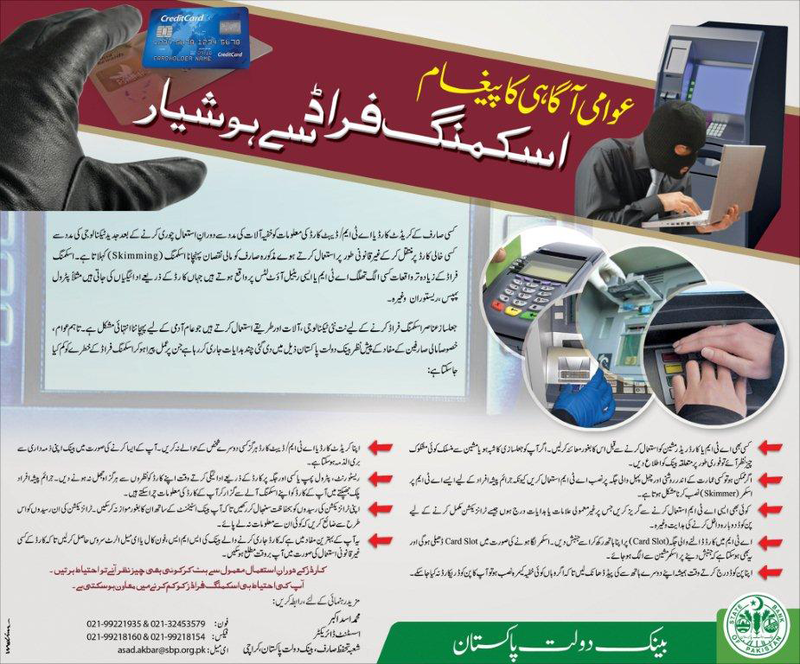 Please contact Meezan Bank Call Center immediately to block your card. QuickPay allows you to pay your Utility, ISP and Mobile Phone Bills free of cost anytime, without waiting in queues at the bank’s counter! Meezan QuickPay service is available 24 hours a day 7 days a week via Meezan Bank’s Internet Banking, Mobile Banking App and ATM Network. Make your Payment by a simple click of a Mouse! Visit any Meezan Bank ATM, insert your Meezan Card and enter your PIN. Go to the Bill Payment menu and select the Payment type and company. Enter the required Consumer Number into the field provided and all the bill details (amount, due date etc) will be shown automatically! You can also register the bill for all future payments so that you do not have to re-enter your Consumer Number every time. Make your Payment with a simple click! With our Call Centre facility, you no longer have to take time out to visit your branch for your everyday banking needs. By simply dialing 111-331-331 or 111-331-332 (dial +92-21-111-331-331 or +92-21-111-331-332 from outside Pakistan) you get access to a wide range of personalized banking services including answers to questions on Islamic Banking. 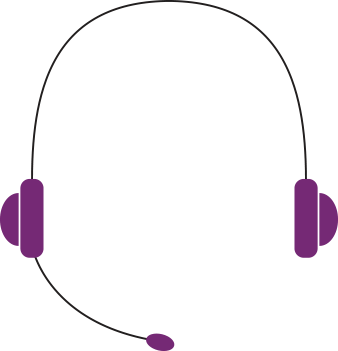 You can also access our self-service banking, where you can access your account details & product information by our Interactive Voice Response System (IVR). 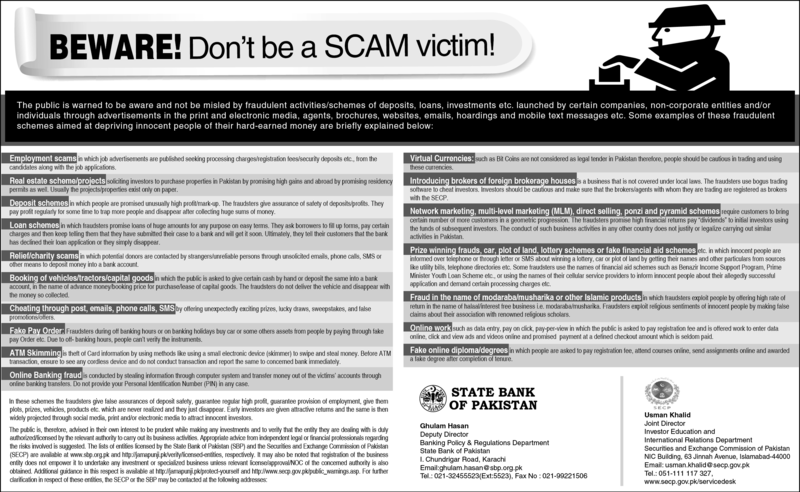 Consumer, ADC & Liability Products Information. ATM / Debit card blocking. 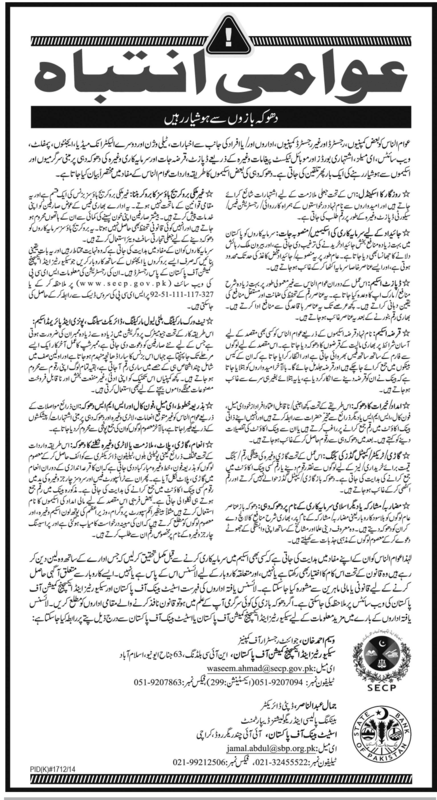 Deactivation of Internet Banking services. Transfer funds from your Meezan Bank account to any Meezan Bank account free of charge. Inter-Bank Funds Transfer (IBFT) is available at all Meezan ATMs. Transfer funds from your Meezan Bank account to any other 1-Link Member Bank's account. Pay your Bills through to Meezan QuickPay free of charge for all major Utility Companies, Internet Service Providers, Phone and Mobile TelCos. Redeem funds from your Al-Meezan Investments account(s). 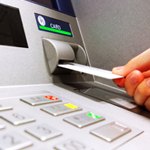 Free ATM cash withdrawal Takaful for Customers with monthly average balance of Rs. 10,000 and above. 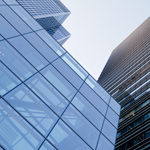 Issuance of Banking Certificate such as Balance Confirmation, Withholding Tax, Profit Payment, etc.